Gorham "St. 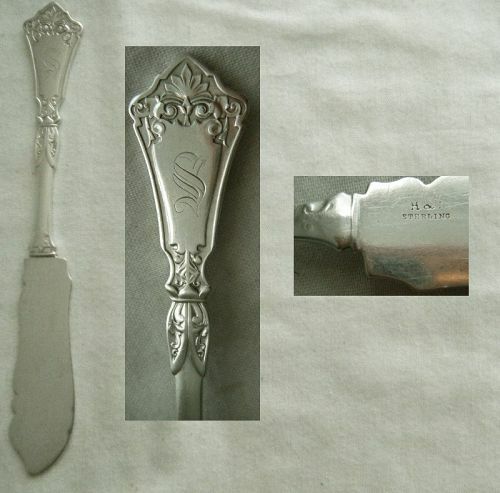 Cloud" Sterling Silver Youth Fork, "Gladys"
Marked with Gorham's "lion, anchor, G" emblem, along with "Sterling" and "Pat 1885," this 5 7/8" long, .9 T. oz., youth fork once belonged to "Gladys," whose name is engraved in script on the backside. The pattern is "St. Cloud," one of the outstandingly successful designs produced by Antoine Heller in his long and consequential career with Gorham. A very early example of Gorham's multi-motif "Versailles," this piece is stamped on the heel backside with the company's "lion, anchor, G" emblem, "Sterling," and "Copyrighted '88." It is a 6" long, 1.0 T. oz., sugar spoon with an oval, flange edge, generously proportioned, plain bowl. The figure is a cherub holding a lyre. Price per piece, three available. Introduced in the first years of the twentieth century, Gorham's "Virginiana" quickly gained popularity, and remains a sought after pattern today. An Art Nouveau design, it features poppy blossoms, leaves, and complementary trailing elements set in textured, high relief, detail. This example is a 4 3/4" long, relatively heavy at nearly .6 T. oz., egg spoon. It has an ovoid bowl with a gold wash interior, and is monogrammed with an Old English "E" on the handle. Price for the set of six. 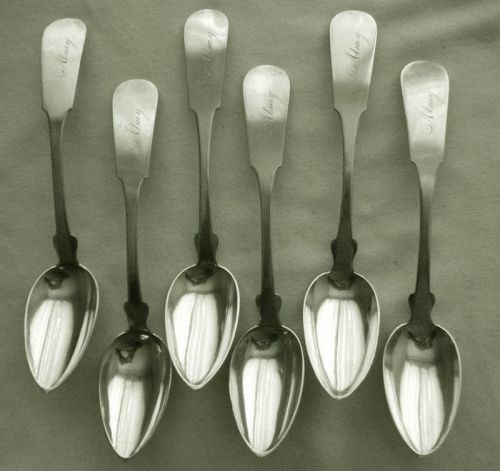 Dating to the earliest decades of Gorham's history, these six, matched, coin silver, spoons are marked "Gorham & Webster," for a partnership that traces to 1831-37. Each one measures 7 1/2" long, which is an unusual size by contemporary convention in that it is lengthier than a dessert spoon but not quite as long as a tablespoon. In their time, when large scale was favored, these would have served as standard place pieces. Devised in 1900 by the Graf Niemann Company of Pittsburgh, Pennsylvania, the "Earl Patent Fork" was an adaptation of a standard youth implement. This example is based on a 5 7/16" long, just over .6 T. 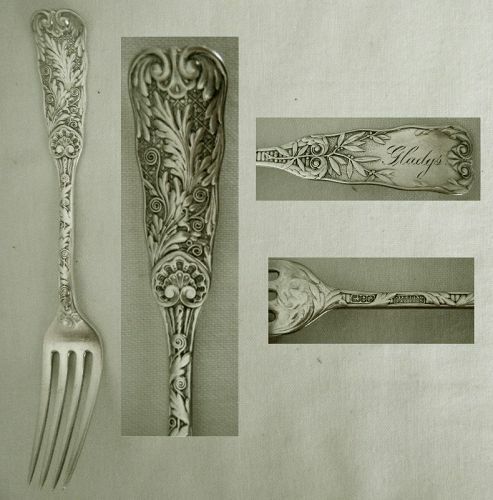 oz., fork in Whiting's "Louis XV" pattern. It is fitted with a finger slot (with trim matching the pattern) on the back, intended to direct the way the child would hold the piece. A 6" long, .7 T. oz., this piece was likely an individual for ice cream spoon, although it could even have been a sugar. Stamped "H & M" for the partnership of (Henry) Hebbard & (George) Moore, New York City, it dates 1861-65. It is also stamped "Sterling," and while coin silver was still the dominant standard in this period, Hebbard retailed much of his output through Tiffany, which required sterling, so he likely produced with this in mind. Each of these two identical place forks measures 7 1/16" long. They are heavy, with the pair weighing 3.4 T. oz. combined. Dating from the late 19th century, they are high quality items stamped "Hennegan, Bates Co." for the prominent Baltimore firm, and "Sterling." A large item, this sugar sifter measures 7" long and has a round, pierced bowl that is 2 3/8" in diameter and 5/8" deep. It is substantial weight at 1.9 T. oz. The pattern is "Grecian" originated by Henry Hebbard, as evidenced by the "H.H. Pat. 862" imprinted on the backside. Early versions like this were frequently retailed by Tiffany, while the design itself became part of the Whiting stable of patterns circa 1882. This "leaf" design, often identified as "Josephine" because of Gorham's use of that name for its variant, was produced by several mid 19th makers with slight variation among them. This example, a full size dinner fork measuring 7 5/8" long and weighing nearly 2.8 T. oz., was made by Henry Hebbard, as indicated by the "H.H. & Co. Patent 1855" stamped on the reverse, along with the retailer's name "Robert Rait," both mid 19th century New York City firms. A pattern developed by New York City's Henry Hebbard, "Mask" eventually became a standard line offered by Whiting. This 5 1/4" long, just over .6 T. oz., mustard ladle is an early production piece marked "H.H." for Hebbard, "Patent 1859," "5," and with the name of the retailer, New York's "A. Rumrill & Co."
Born in 1782, Horace Seymour Hinsdale enjoyed a long working career in New York City, spanning nearly all of the first half of the 19th century. Early associated with the partnership of Taylor and Hinsdale, this example stamped only "Hinsdale" and with a "lion, W, bust" pseudo hallmark that McGrew in Manufacturers' Marks on American Coin Silver attributes to Jacob Wood, dates it to the 1830s or early 1840s. This 8 3/8" long, 1.9 T. 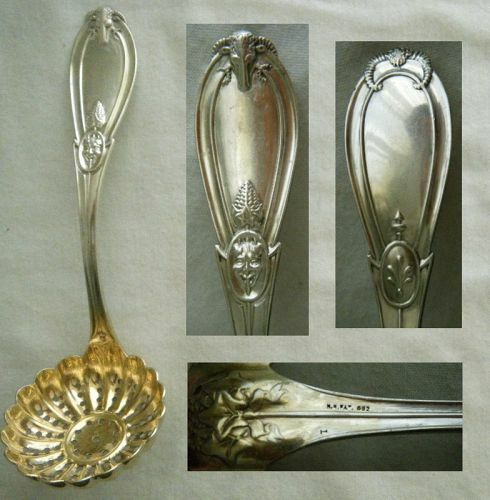 oz., berry spoon falls within the broad category of "Medallion" patterns that were inspired by Classical mythology. Produced and individualized by numerous makers in the 1860s, this piece is marked "H&S," for Syracuse, New York's Hotchkiss & Schreuder and features an image of a youthful Dionysus on the handle front. The entire lines carries this one figure. Price per piece, two available. 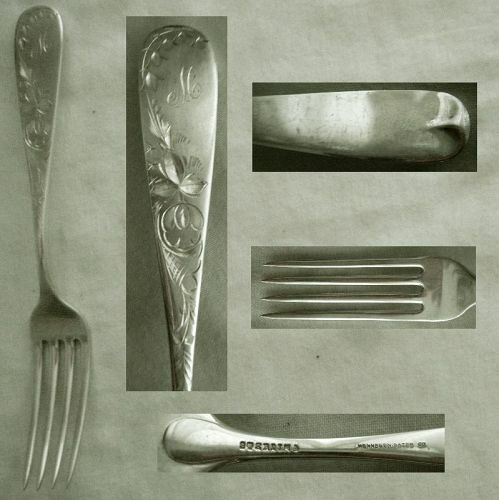 Now thirty years past publication, D. Albert Soeffing's Silver Medallion Flatware remains the only single definitive volume addressing this line of classically inspired flatware designs that so called to American silver manufacturers in the 1860s. Hotchkiss & Schreuder of Syracuse, NY, operated under various names from the mid to late 1800s. The "H&S" mark (along with "Sterling") imprinted on the blade of this 7" long, relatively weighty at 1.2 T. 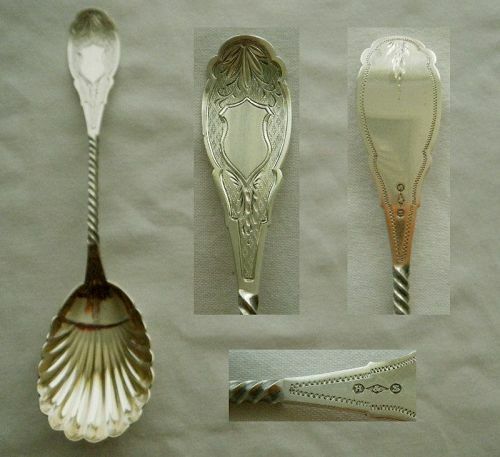 oz., master butter knife in the company's "Unique" pattern was used 1864-71 according to an entry in Rainwater's "Encyclopedia of American Silver Manufacturers." This example of late Victorian grape shears or, as period catalogues identify them, scissors, are of a quality that set the bar for such pieces. They excel in terms of design, manufacture, and material. The first factor that stands out is that they are made of solid sterling silver. Grape shears typically have steel cutters, while these are clearly marked on the backside of the lower blade "Howard & Co." and "Sterling," which applies to the entire piece. A substantially sized piece, measuring 8 3/4" long and weighing 1.4 T. oz., this spoon traces to the mid 19th century. It is marked "Huntington & LaBoyteaux" for a partnership that existed 1850-56, between William C. Huntington, who first established himself in Cincinnati, Ohio, in 1846, and Issac N. LaBoyteaux (Cincinnati Silver, Amy Dehan).